Cricket Hollow Zoo is facing another legal challenge from the Animal Legal Defense Fund (ALDF) over alleged mistreatment of animals remaining at its rural Manchester "animal park." The roadside zoo was forced to give up its endangers lemurs and lions after a federal court ruling a year ago, and now ALDF has filed suit against zoo owners Pam and Tom Sellner in Iowa District Court alleging "persistent neglect of its animals," and "flagrant disregard for federal and state animal protection laws. . ."
The federal district court decision ordering the removal of lemurs and tigers from the troubled Cricket Hollow Zoo near Manchester, Iowa, last October was upheld today (4/11) by the U.S. 8th Circuit Court of Appeals. The federal appellate court in St. Louis ruled that Lisa Kuehl, Tracey Kuehl, Nancy A. Harvey, John T. Braumann and the non-profit animal rights group, the Animal Legal Defense Fund (ALDF), had legal standing to file the lawsuit to stop the mistreatment of the animals under the Endangered Species Act. A decade after animal welfare violations were initially documented and more than two years of legal proceedings, the U.S. Department of Agriculture (USDA) has revoked the license of Cricket Hollow Zoo near Manchester, Iowa, and fined owners Thomas and Pamela Sellner $10,000. The USDA decision announced November 30 would appear to spell the end of operations at the troubled facility since the zoo must have a USDA license to continue to operate. After four days of testimony pitting U.S. Department of Agriculture (USDA) officials against Cricket Hollow Zoo owners, an administrative law judge will decide later this spring if the roadside zoo near Manchester, Iowa will retain its federal license. The hearing before the administrative law judge was held in Davenport beginning Tuesday (1/24) and included testimony from USDA Veterinarian and Inspector Heather Cole, Iowa Department of Agriculture and Land Stewardship Compliance Investigator Doug Anderson, zoo owners Tom and Pamela Sellner and Robert Gibbens, Western Regional Director of the USDA's Animal and Plant Health Inspection Service in Fort Collins, CO. 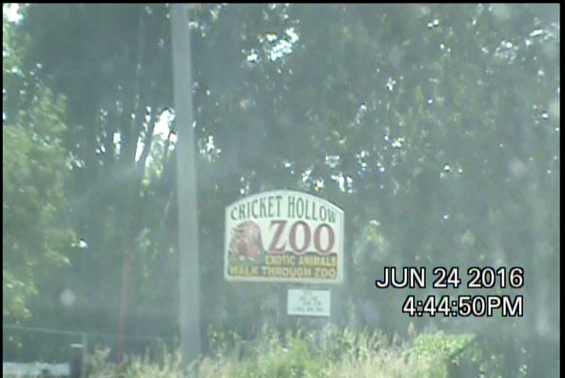 The USDA complaint against Cricket Hollow runs more than 20 pages and cites dozens of violations of the Animal Welfare Acts (AWA) by the zoo in 2014 and 2015. An animal rights group has asked the Delaware County Sheriff to file criminal animal cruelty charges against the Cricket Hollow Zoo owners over care of a lioness rescued from the roadside facility near Manchester, Iowa last August. The two remaining endangered animals kept at Cricket Hollow Zoo – African lionesses named Jonwah and Njjarra – have been relocated to a wildlife sanctuary in Colorado after settlement of a federal court lawsuit filed against the zoo by the Animal Legal Defense Fund (ALDF) and five Iowa residents. The Wild Animal Sanctuary in Colorado, with veterinary support from the Blank Park Zoo in Des Moines, took custody of the two lions after the settlement was reached with zoo owners Pam and Tom Sellner of Manchester, Iowa, according to a news release issued by the ALDF today (Aug. 3). A federal judge today (July 21) ordered the examination of a Cricket Hollow Zoo lioness and set an expedited trial date for August 1 to determine if the two African lions should be permanently removed from the roadside zoo. In an unusual telephone hearing, Chief Judge Linda Reade of the U.S. District Court in Cedar Rapids ordered the zoo allow a Colorado veterinarian with experience in the care of lions examine the lioness Njjarra. Click on image above to view the video showing the two African lions at Cricket Hollow Zoo. The video was submitted as part of a court filing seeking immediate removal of the lions from the roadside zoo. A special telephone hearing will be held Thursday (July 21) to determine if a lioness at Cricket Hollow Zoo should be removed immediately from the troubled roadside zoo, or if a "qualified veterinarian" should be allowed to examine, diagnosis and treat the animal. The endangered African lion is one of two at the zoo, and a video taken June 24 shows the sick and emaciated lioness named Njjarra in her cage at Cricket Hollow. The Animal Legal Defense Fund and the Iowa residents who won their federal court case in February against Cricket Hollow Zoo have now appealed the judge's decision to not award attorney fees, allowing the zoo owners to choose where the zoo tigers and lemurs were relocated, and for failing to address one of the lawsuit claims the zoo engaged in unlawful trafficking of endangered animals. An Iowa man visiting the Cricket Hollow Zoo with his two children June 24 says in court documents one of the roadside zoo's two lions "was in such a terrible condition that both children and myself feared that she would die at any moment." "We didn't need to get too close to her cage to know that there was something terribly wrong with her, because she just stood in one corner of her cage shivering even though she was in direct sunlight," Jeff Marlin, of Hiawatha, Iowa, testified in a court filing seeking immediate removal of the now-endangered animals from the troubled zoo near Manchester.